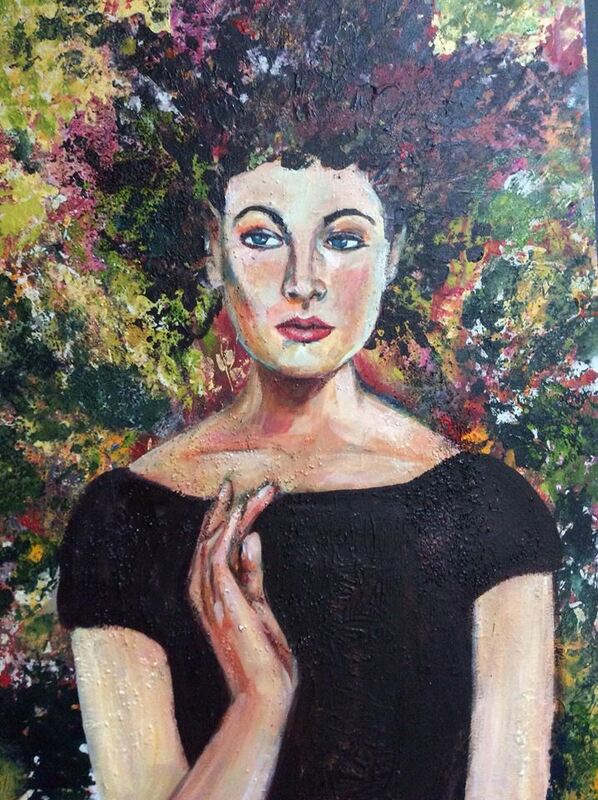 This painting is one I did earlier this year. 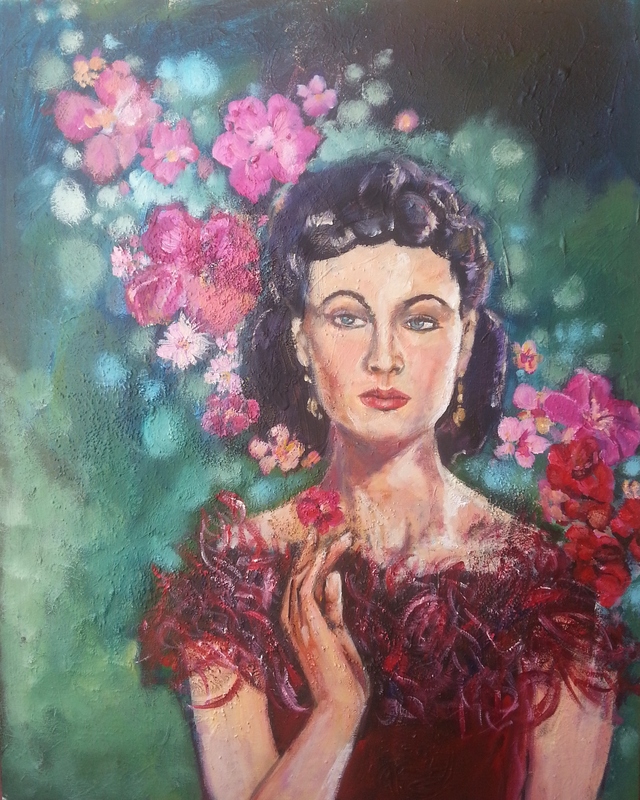 A portrait of one of my favorite actresses, Vivien Leigh. I experimented with heaps of leaf prints and texture, but was unhappy with the colours and overall look of it. This is the before picture (right) and after (left)….its kind of apt for Vivien, seeing these side by side, since she was very theatrical, a true artist who played many roles. Painting is 61x76cm, acrylic on textured canvas. I have been looking at paintings by pre-raphaelite artists. 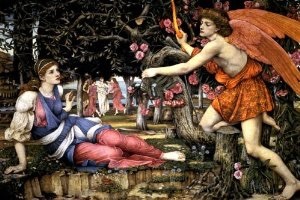 These include artists such as Millais, Burne-Jones and of course Dante Rosetti. They were driven to represent spiritual forms in much the same manner as artists from the Renaissance prior to Raphael, and in the Middle Ages. It was very needed in this time in history, since industrialisation and modernism created a kind of vacuum to artistic expression that was spiritual in subject matter. I love the way their paintings tell a story; and to try to depict celestial beings such as Angels is a noble but at the same time curiously earthly thing to do. I say this because our angels or visions of heaven, no matter how sublime and beautiful are probably to heavens eyes like a child drawing with crayons on a paper napkin. But it’s a joyful thing, and a way that art brings humanity into something bigger than ourselves. It’s also interesting to me how the spiritual realm is so often the subject matter if artists throughout the ages. The pre-raphaelites, however, perhaps hit on something within our culture at this point in time, maybe as a neo-modernist society (for lack of a better term; I am not sure that our culture can be termed as post modernist anymore, and I have not found a term that fits), we live in somewhat of a cultural desert. Everything is mass produced, and like industrialisation, the demands of productivity are at a premium (collateral from a disposable society). We are in need of the integrity, joy, depth and mystery found in the spiritual, which brings reassurance that not everything is banal and throw-away. That something exists outside of that, beyond clear perception that is more real and meaningful. For me, these pre-raphaelite paintings help me see these things. They touch something deep within my soul, giving almost a feeling of wistful nostalgia.